What do our clients think? Average 5 out of 5 based on 89 reviews. Unhappy with your nose but not keen on having surgery? A non-surgical nose job (non-surgical rhinoplasty) treatment might be the solution you’re searching for. A nose enhancement is an instant correction improving the height your nose bridge, reducing the appearance of bumps, correcting asymmetry following a sports injury or surgical rhinoplasty and rebuilding the nose following recreational drug use. Treatment is available in the UK from botonics at our prestigious Harley Street clinic, in the heart of London’s private medical district. A dermal filler nose enhancement is an advanced treatment, and needs to be done by an expert to reduce the risk of asymmetry and to produce a natural looking result. 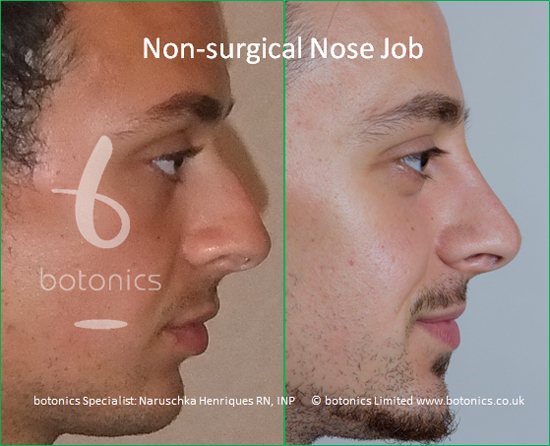 At botonics, we have developed techniques that produce an instant and natural looking result with minimal discomfort. Take charge of your appearance with our high performance and clinically proven dermal filler treatments and be the best possible version of you. 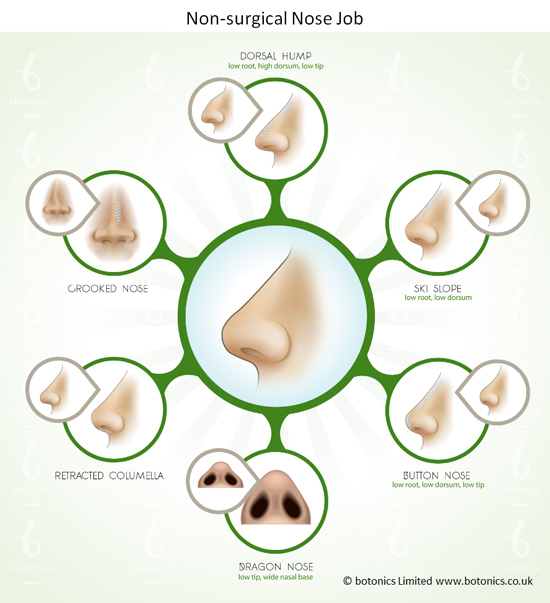 Flat or low nose bridge: Some ethnicities (e.g. from north-east Asia and China) naturally have a lower nose bridge. This can instantly corrected with dermal filler. Crooked, hooked noses with dorsal humps: A crooked nose can be congenital (i.e. present from birth) or can occur through sports injury. Hooked noses or those with a hump can be smoothed out with a non-surgical rhinoplasty treatment and will often look smaller after treatment. Ski slope: Noses with an aesthetically pleasing bridge and tip can be deficient in between, resulting in the ‘ski slope’ nose. This condition is improved via dermal filler to straighten the mid-section of the nose. Rhinoplasty revision: Quite often following a surgical rhinoplasty procedure the nose has minor bumps or asymmetries that can be instantly improved with a non-surgical nose job. Recreational drug use: The consumption of recreational drugs through nasal passages can erode the septum and nostrils. These areas can sometimes be augmented via dermal filler. At your free consultation, the expert will review your detailed medical history and advise whether a dermal filler treatment to your nose is appropriate for you. Most people prefer the single step approach: consultation and treatment in the same appointment, which is usually possible. However, you’re in charge so there’s never any obligation to have treatment if you’re not satisfied to do so. Your specialist will then apply a powerful, targeted topical anaesthetic, and then wait for it to take full effect (about 20 minutes). In addition to the topical anaesthetic, our high performance dermal fillers also contain an anaesthetic which further reduces discomfort (though it can result in more swelling than non-anaesthetic fillers). The injections only take about 10 – 20 minutes. *How Long Does it Last? The duration of dermal filler is usually quoted as 6 – 12 months by the manufacturer. However, in our experience, the aesthetic benefit of a nose enhancement (e.g. masking a nose bump, lifting a nose tip, elevating a low bridge, straightening a bent nose, etc.) will be gone sooner even though filler remains. A typical pattern for nose enhancement clients is to have a nose enhancement 2 – 3 times in the first year, then 1 – 2 times/year thereafter. There are many factors that can shorten the duration of filler (e.g. fast metabolism, poor diet, smoking, lack of sleep, cardiovascular exercise, large muscle mass, etc.). We have no control over how long filler lasts once it is injected, and so can offer no warranty as to aesthetic duration. Once the body has gotten used to the filler, and we are working on an established foundation, then the aesthetic benefit starts to have a longer duration. To learn more, see our Frequently Asked Questions. If you want to know what actions you can take before and after your treatment to get involved in your recovery, see our Aftercare Instructions. Our cosmetic filler treatments are administered by qualified medical experts who are highly experienced in performing non-surgical nose jobs. Our price for nose enhancement treatments start from just £500, and you can spread the cost of any treatment over £600 interest free for up to three months. If you’re tired of your nose then take action and fight back. A small investment of your time for a free, discrete and no obligation consultation can help you decide if a non-surgical nose job is the solution you’re searching for. Contact us to book a free consultation with our Non-surgical rhinoplasty expert.